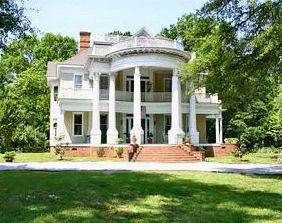 Newberry South Carolina bed and breakfast, The DeWalt House. The DeWalt House offers relaxation and refinement in the historic and award-winning town of Newberry, SC - home of the renowned Newberry Opera House, Carter-Holmes Orchids and many fine restaurants and shops. 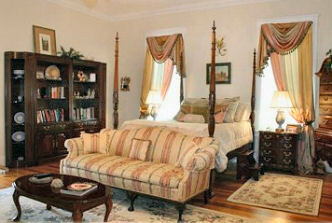 The home is filled with antiques and reproduction pieces reminiscent of a time gone by. Remove the stresses of the day - Read a book, rock on the shady porches, walk or bicycle the streets of this delightful town. Everything is planned for your relation and enjoyment. In addition to several public rooms (dining room, parlor, music room and hallways) the three bedrooms all have sitting areas, private baths, queen beds, TV/DVD/CD, telephones, iron and ironing boards, hair dryers and many additional amenities. The Baron deGrau room features a 2-person jacuzzi and additional TV in the dressing area. Deluxe continental or full breakfast is provided along with daily snack and a complimentary refreshment area. Can arrange for masseuse or guides for local sites.